Save a Design/CPN model in XML format. Convert the XML file generated by Design/CPN to the XML format for CPN Tools. Load the file generated by the converter in to CPN Tools. The first step to transferring a model from Design/CPN to CPN Tools, is to save the model in XMLformat in Design/CPN. This is done by using the Save XML… entry in the File menu. Note that the Save and Save as… entries will not save a model in XML format. After selecting the desired group of pages, the Save XML entry can be selected. After saving a model in XML format from Design/CPN, the model must be converted to anotherXML format which is used in CPN Tools. A converter is available for just this purpose. Currently, the converter can only be run under Windows, i.e. a Linux version of the converter is not available. 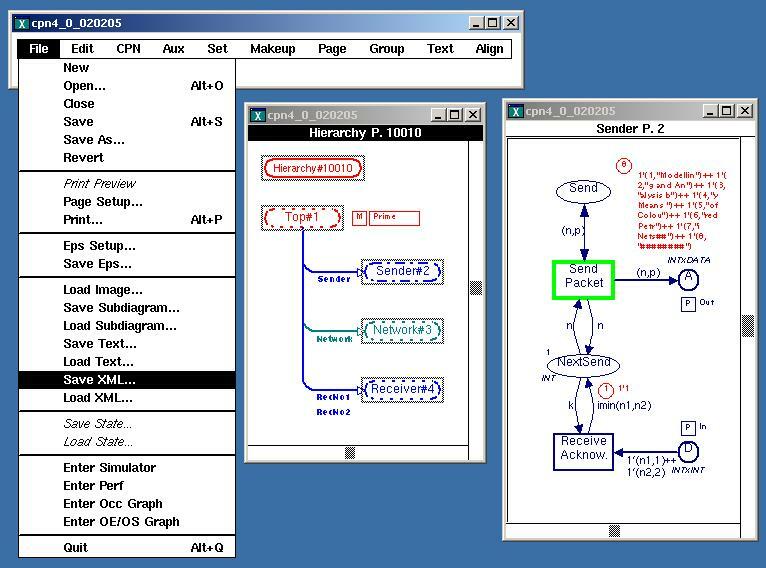 The converter is distributed together with CPN Tools for Windows. The converter can be started from the Windows Start menu, e.g. Start Menu ⇒ Programs ⇒ CPN Tools ⇒ Utils ⇒ converter. After the converter has been started, a dialog box will appear, allowing you to select the file that is to be converted. Pressing the Open button will convert the selected file. The converter generates files with the extension .cpn. 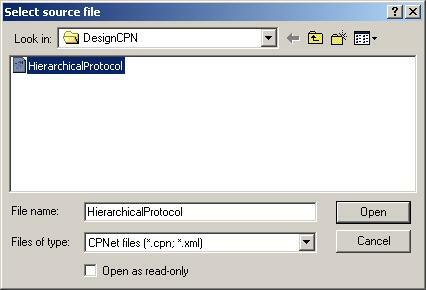 For example, if the file HierarchicalProtocol.xml is converted, then the file containing the converted model will have the name HierarchicalProtocol.cpn. If the output file has the same name as an existing file, then a new dialog box will appear allowing you either to overwrite the existing file or to rename the output file. You can Load a net from a file that was generated by the converter. 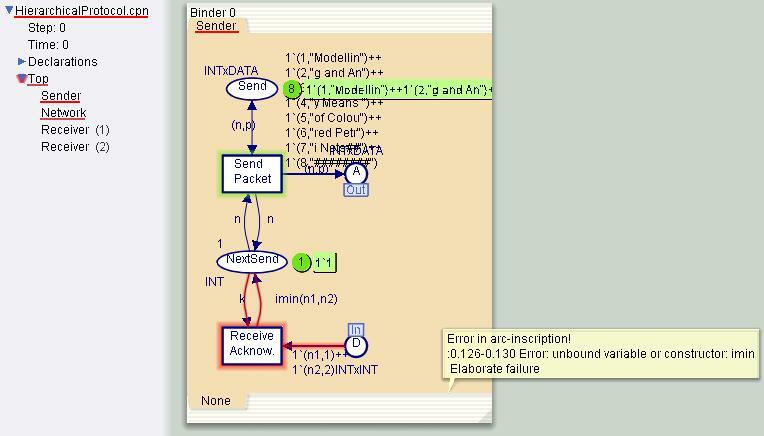 During the syntax check of a converted model, inconsistencies between Design/CPN and CPN Tools will be discovered. For example, some functions that are available in Design/CPN are not available (under the same name) in for CPN Tools. In many cases, a similar function with a different name will be available in CPN Tools. Color-coded auras and highlights will reveal where the problems can be found. Here, for example, the syntax check reveals that the function imin is not available in CPN Tools. It can, however, be replaced with the function Int.min. Here is an overview of some of the keywords and functions that are different in Design/CPN and CPN Tools. color colset Keyword used when declaring Color sets, CPN Tools should also recognize color and automatically convert it to colset. declare Keyword used to declare additional functions and constants for color sets. Obsolete in CPN Tools, as all relevant Color set functions are automatically defined for all Color sets. pageref Keyword for declaring a page reference variable. Not supported in CPN Tools. instref Keyword for declaring an instance reference variable. Not supported in CPN Tools. For more information about some of the functions that are available in CPN Tools, see the help pages for the individual Color sets and Color set functions.